Actor Billy Dee Williams is known to many from his role as Lando Calrissian in the Star Wars films. His other important acting roles include Lady Sings the Blues with Diana Ross, and the Emmy Award winning television movie Brian's Song. However, before he was an actor, Billy Dee Williams was an artist. He began drawing as a child. He attended the High School of Music and Art in New York City, and won a scholarship to the National Academy of Fine Arts and Design in New York, where he studied for two years. According to the bio at his website, it was the need to earn money to buy paints and canvas that lead his extensive credits in both television and film. It goes on to say that he renewed his enthusiasm for painting in 1988 during an acting appearance in New York, and that since 1991, he has had numerous solo art exhibitions across America. He has donated paintings to the National Portrait Gallery in Washington, DC and The Schomburg Museum in New York. Much of Billy Dee Williams' artwork seems to be based on music or musicians. 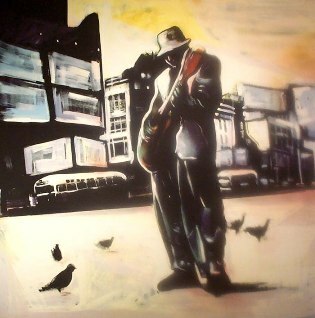 His apparent love for music extends beyond his artwork. 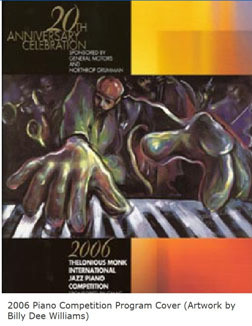 He is Honorary Co-Chairman of The Thelonious Monk Institute of Jazz, and since 1990 his artwork has been used for the cover of the Institute's competition souvenir program. In the video posted below, Billy Dee Williams talks about his introduction to art and acting as a child, about his artistic process, and what inspires him. He says that he and his twin sister were the best artists in the first grade at his school. For more information about Billy Dee Williams' artwork visit his official art website http://www.bdwworldart.com/. Visit the Pop Life Art homepage for links to the artwork of more than 100 celebrity artists.